Maternal mental health advocate Claire Kerr-Zlobin was surprised to learn Canada is funding postpartum depression screening projects abroad while, at the same time, not recommending the practice here at home. “I’ve been trying for years to get traction on universal perinatal depression screening for mothers in Canada,” Kerr-Zlobin, founder of Life With A Baby, told Huff Post Canada. In late May, non-profit organization Grand Challenges Canada (GCC) announced $10 million in funding, with support from Global Affairs Canada (GAC), for 100 projects supporting women and children in low and middle-income countries around the world. GAC does not review projects before they are implemented, spokesperson Amy Mills told HuffPost Canada. Three of the projects focus on perinatal depression screening, two in India and the third in Kenya. Each project received $100,000 with the chance of acquiring an additional $1 million for further research. In Kenya, where rates of postpartum depression (PPD) aren’t recorded, Piret Partners Consulting of Washington, D.C. in collaboration with the Kenya Field Epidemiology Training Program are conducting research on a non-verbal pictorial scale to screen women for prenatal and postpartum depression in four northern Kenyan counties. In India, where the estimated prevalence rate of postpartum depression is said to be 22 per cent, researchers at BEMPU Health Pvt Ltd are using the funding for “BHappy,” an app nurses are using to screen new mothers for depression at discharge, and at their four and six-week post labour check-ups. Also in India, OneKeyCare Ventures Private Limited is using the $100,000 in funding to test a smartphone app that community health workers are using to screen for postpartum depression in rural areas. The app uses visual cues and the Edinburgh Postpartum Depression Scale (EPDS). If a woman tests positive for PPD, she will immediately receive a call from a psychologist in an urban setting who will further evaluate her. If severe, she will be immediately referred to the nearest hospital with a psychiatry department. If non-severe, she will receive five weeks of tele-counselling and further psychological assessment. “By using information technology, we are bridging the divide between urban and rural India and getting expertise that is available in urban areas to deliver services in rural areas,” OneKeyCare Ventures Private Limited, Co-Founder and Project Manager Sumeet Singh told HuffPost Canada. According to their 2016-2017 annual report, to date, GCC has invested $83 million in 107 projects in 34 countries, leveraging over $107 million in additional funding. They estimate their program will improve the lives of up to 42 million people by 2030. GCC Vice President of Programs Dr. Karlee Silver told HuffPost Canada that bringing the benefits of the projects to Canada, including the ones on postpartum depression screening, is “definitely” part of their long-term plan. “I think there’s still a disconnect between what is being funded and where Canadian taxpayers’ dollars have actually gone to find out across the world and what is being moved on internally,” Silver said. Up to 20 per cent of women in Canada suffer from a maternal mental illness such as postpartum depression, according to a recent report by the Public Health Agency of Canada. But while Canada doesn’t recommend perinatal depression screening, other countries such as the United States, the U.K., and Australia all do. If a recommendation for perinatal depression screening in Canada were to be made, it would come from the Canadian Task Force on Preventive Health Care(CTFPHC), an independent, arms-length body of up to 15 experts funded by the Public Health Agency of Canada. The CTFPHC makes recommendations based on a rigorous review of evidence every five years. “There is currently not any information available regarding an update to the 2013 Task Force guideline on depression screening,” Dr. Brett Thombs, CTFPHC Chair told HuffPost Canada. Those guidelines recommend screening only when symptoms are apparent. Though Canada has funded perinatal depression screening studies via the Canadian Institute for Health Research, the CTFPHC told HuffPost Canada their 2013 guidelines was a “weak recommendation,” not because there was weak evidence of benefit, but because no randomized control trials (RCTs) were encountered, and there was no evidence that screening would improve mental health. RCTs are considered the gold standard in scientific research. Kerr-Zlobin recently presented at the National Healthcare Leadership Conference in St John’s, N.L., a gathering of Canada’s top healthcare decision makers. Hers was one of eight motions debated during the conference’s Great Canadian Healthcare Debate. 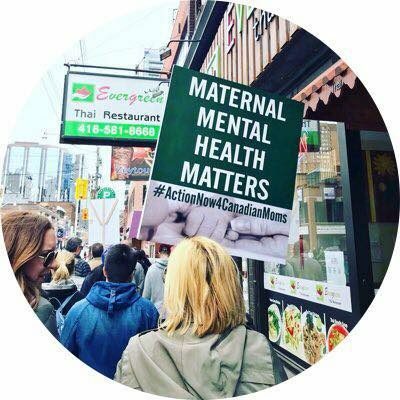 “I presented a motion for a national strategy on maternal mental health with the goal of implementing a universal perinatal depression screening and treatment program by 2020,” Kerr-Zlobin said. Much work to be done in Canada. In my province we have far to many mothers dieing over ppd. The stigma is real, even among doctors and we don’t have sufficient supports available for those diagnosed.